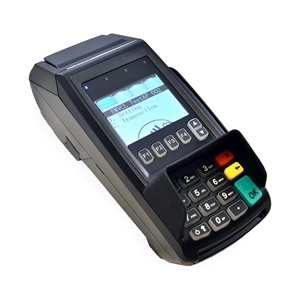 The Dejavoo Z8 is contactless terminal with a dual communication with EMV and NFC contactless built in. Dejavoo Z8 - TSYS Network Only. The Z8 countertop payment terminals provide an easy to use EMV payment experience for every business owner. With “On screen Help”, easy access to frequently used options in the “Favorites” Menu, and a simple “Call Me” button to request a support representative callback, merchants love the ease of use and ISOs love the easy programming of Dejavoo. • Built in Loyalty Program – no loyalty cards or host communication needed! • Connects with DeNovo business portal for transaction upload, signature capture, loyalty back up, batch notication, Call Me, Messaging & more. • Optional WiFi models for Tri Comm (IP, Dial & WiFi) with Quick and Easy WiFi set up. Terminal nds available networks! • Free access to facilitate and manage your own merchant download proles via the Dejavoo STEAM le build system.